The Eleventh Doctor wears the orange spacesuit when he travels to the newly-formed Earth. 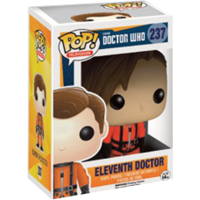 This limited edition BGVToys Exclusive Eleventh Doctor in Spacesuit POP vinyl figure stands around 9.5 cm tall. It's a perfect addition to everybody's Doctor Who POP collection!